Born to a wealthy and pious family, Bernard was well educated, but spent a wild and dissolute youth. During one of his revels he received a leg wound in a duel. His recovery gave him time to think, and the young man realized that he was headed in the wrong direction. 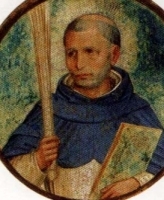 As he was healed, Bernard renewed his life in the Church and then joined the Dominicans in Catania in 1452. Noted for his charitable works, his life of repentance for his earlier ways, his strict adherence to the rules of his Order, and his devotion to contemplation of Christ's Passion, which would sometimes send him into ecstacies. Founded a hospital for the poor. A gifted preacher, he preferred to spend his time in the confessional and working as a spiritual director. Had the gift of prophecy, and used it to warn people to change their lives; prophesied the date of his own death. Legend says that when Bernard walked in the gardens of his monastery, birds would come down to sing to him, but would stop when he went into prayer. Once when a porter was sent to Bernard's room to fetch him, the man saw a bright light shining under the door, and when he peeked in he saw a beautiful child who was shining with light and holding a book from which Bernard was reading. Daughter of a pagan named Africanus who promised the girl to a young noble named Evilase. Juliana put him off, first insisting that he become prefect of Nicomedia. When he became prefect, she insisted he become a Christian before they could marry, a condition he would never meet. Her father, who hated Christians himself, abused Juliana fearfully to get her to change her mind, but she held fast; ancients manuscripts describing these horrors put them in terms of her fighting a dragon, and she is often depicted that way in art. Evilase called her before the tribunal during the persecutions of Maximianus, denounced her as a Christian, and she was martyred. Hers was a favourite story, for telling and creation of stained glass and other art objects, during the Middle Ages. Bishop of Mayferkqat, Syria, part of the kingdom of Persia, in the late 4th and early 5th centuries. Presided over the Council of Seleucia. Worked to build and repair churches that had been lost during the persecutions of King Sapor, and collected so many of the relics that had been scattered during that time that his see city became known as Martyropolis. He composed a number of hymns in honor of the martyrs, and wrote “Acts” of as many as he could research. Because of the wealth of his theological writings, he is honored as the chief Doctor of the Syrian Church. Maruta once went to the court of King Yezdigerd to seek an end to persecution of Christians. While there, he was able to cure the king of a series of violently painful headaches. The Zoroastrian priests, afraid that the king might convert to Christianity, rigged up a hiding place in the floor of their temple. There a priest waited, and when the king came into the temple, the priest shouted that the Christian should be sent away from such a holy place. The king was ready to obey the mystical voice until Maruta pointed out the trap door and the hidden priest was dragged out. The king did not convert, but grudgingly agreed to tolerate Christians. Born to the Italian nobility, in his youth Nicola received a vision of an angel who warned him not to eat meat as he would one day join a religious order that had a permanent rule of abstinence. 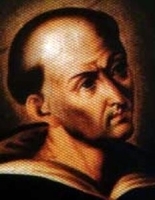 He was a university student in Bologna, Italy when he heard the preaching of Saint Dominic de Guzman. He soon after joined the Dominicans, receiving the habit from Saint Dominic himself. Priest. Noted and successful preacher. Twice provincial of the Dominicans in the enormous province of Rome. Founded monasteries in Perugia and Trani, promoted Scripture study and the compilation of a Bible concordance. Commissioned by Pope Gregory IX to preach Crusade against the Saracens. Reported miracle worker. He spent his final years as a prayerful monk in the Dominican monastery in Perugia. Fourth of five children; nephew of Saint John Cafasso. His father died when Joseph was three years old. Studied at the Salesian Oratory in Valdocco, Italy; Saint John Bosco was one of Giuseppe's spiritual directors. He entered the diocesan seminary of Turin, Italy in November 1866. Ordained on 20 September 1873. Spiritual director of the Turin seminary. Appointed rector of the Consolata Shrine on 2 October 1880; he remodeled the shrine, and made it a source for spiritual renewal throughout the diocese. Founded the Consolata Missionary Priests and Brothers on 29 January 1901; the first missionaries reached Kenya in 1902. On 29 January 1910 he founded the Consolata Missionary Sisters for women with a missionary vocation. Leader of a group of martyrs, some or all of whom may have been imperial soldiers. The dates are unknown, and none of the names of his companions have come down to us, and we have no other details of their demise. After having met Saint Francis of Assisi in her parents' home, she became a hermit on a mountain above Mareri, Italy. Poor Clare nun. Founded a Franciscan convent in Rieti, Italy with the help of Blessed Roger of Todi. Abbess. Fourth century bishop of Metz, France. Bishop. Imprisoned and sentenced to forced labour in the mines of Cilicia for two years. Martyr. Bishop of Brescia, Italy c.360. Legend says that he was a relative of Saint Faustinus and Saint Jovita, and we know that he researched and wrote their Acts. Patriarch of Constantinople in 565. Established regulations that became the code of laws known as the "Nomocanon". Monk and abbot in the late 10th and early 11th centuries. He is mentioned in some documents, but little about the man has survived. Benedictine monk. Abbot of Saint Gabriel's monastery at Airola, Campania, Italy. Priest. 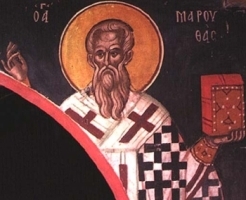 Bishop of Ephesus. Supported Saint Ignatius of Antioch. A group of Christians who ministered to other Christians who were condemned to work the mines of Cilicia in the persecutions of Maximus. They were arrested, tortured and martryed by order of the governor Firmilian.